Google Earth Pro for Desktop provides a wealth of GIS data and information. Just from the free primary database within the application, users can turn on and off boundaries and labels such as roads, county and city boundaries, water bodies, park/recreation areas, historical imagery, and more. 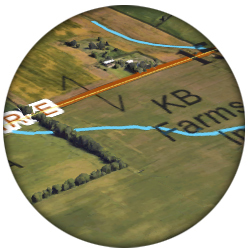 These free datasets can be extremely useful when navigating GeoPlat–Rockford Map Publishers’ seamless, rasterized county plat map overlay (.kmz) that is designed for use in Google Earth. With GeoPlat, you can import a .KMZ file and view parcel boundaries, owner names, township and range, section lines and acreage on top of the aerial imagery within Google Earth. Besides the free primary database that is included in Google Earth, users also have the ability to upload their own vector and address data. Google’s interface makes it extremely easy to upload your own data even if you don’t have GIS or mapping experience! * Google Earth supports a number of various data types which can be selected in the import window. *Simple address data needs only to be saved as a .CSV. Incorporating and layering GIS data over a plat map is what makes GeoPlat such an exciting and useful plat map product. We regularly source nationwide data to create our plat maps and custom mapping projects. Whether you are interested in land ownership data, mailing addresses, soil data, or any other type of data you can think of… we would love to help you get what you need. Just contact us and ask! Subscribe to our mailing list so you can stay up to date with future company announcements regarding plat maps and spatial data.